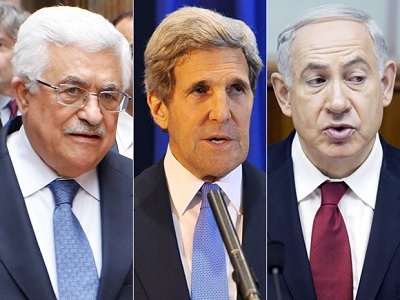 Kerry was supposed to be a mediator between Israel and the Palestinians. The Gaza accord signed by several Palestinian groups, including the two antagonist parties Fatah and Hamas consisted of five main points: 1) forming new national unity government, 2) holding elections, 3) reforming security forces, 4) social reforms, and 5) general liberties. The agreement was obviously an internal national issue outlining the functioning of good democratic governance. Logically, one could surmise that Israel would be very interested in negotiating peace with an entity representing all Palestinians factions. Reaching an (peace) agreement, however, could put an end to the Zionist dream. Israel has used the Sisyphean peace talks to delay the inevitable by transplanting Jewish only population to create new facts on the ground. According to the Israeli organization Peace Now, while “talking peace” for the last nine months, Israel issued permits to build 14,000 new “Jewish only” homes in the occupied land violating article 49 of the fourth Geneva Convention. Israel simply wants to talk, but not to reach an agreement. In a speech on January 28 at the Institute for National Security Studies security conference in Tel Aviv, industry minister Naftali Bennett – head of a major political block in the government – threatened to resign if his government would consider withdrawing from occupied West Bank. A Palestinian unity government would also deflate an excuse for right wing hawks who expressed strong reservations on any future peace deal. They want the division to continue challenging President Mahmoud Abbas’ mandate to speak for all Palestinians. Earlier in the year, Israeli government ministers have also chastised America for its role in the peace process. I hate to tell you George, but today’s American officials are more committed to the foreign entity of Israel than to justice.